Indonesia, known in earlier times as "The Spice Islands", is a splendor of 13,677 islands stretching some 6,400 kilometers across the beautiful turquoise waters of the equator. The principal islands of Indonesia, the world's largest archipelago, are Java, Sumatra, Kalimantan (Indonesian Borneo) Sulawesi (Celebes) and the enchanting island of Bali. The national motto of "Unity in Deversity" aptly describes the endless arry of natural and cultural wonders spread from the country's extremes of Sumatra to Irian Jaya. Indonesia offers the great visual contrasts of snow-capped mountains and shallow mangrove-filled estuaries; dry savanna plains and dense tropical rainforests; broad sandy beaches and steep rocky headlands. Rice, the mainstay of the diet, is grown on emerald terraces that cascade down from smoldering volcanos. 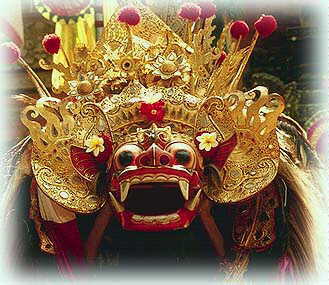 Through the centuries, great civilizations have blossomed in this fertile chain of islands which have contributed to creating Indonesia's unique cultural legacy. With over 366 ethnic groups and 250 distinc languages, Indonesia is a paradise of cultural richness including colorful temple festivals in Bali, some of the world's most sought after textiles in the lesser Sunda islands, Dayak longhouses in Borneo, matriarchial societies of West Sumatra, and primitive groups in Irian Jaya. Black orchids in the jungles of Kalimantan and slothful carnivorous dragons on Komodo island excite the fantasies of the true adventurer and nature connoisseur. DISCOVER INDONESIA for yourself through the exciting tours offered by TUNAS INDONESIA TOURS & TRAVEL. For those who are looking for a truly unique and meaningful experience in world travel, we offer special thematic tours that provide a cross section sampling of the many adventures, cultural wonders and magnificent natural beauty of one of the world's most exciting new tourist destinations.